In order to increase the efficiency of biogas plants, it is necessary to rapidly identify process imbalances, which can lead to increasing hydrogen partial pressures, the accumulation of volatile fatty acids (VFA) and an acidification resulting in the inhibition of acetogenesis and methanogenesis. To control the hydrogen partial pressure and the VFA concentrations, an anode will be installed into the biogas fermenter. Anode reducing organisms will consume VFA and hydrogen concentrations controlled via the applied potential. 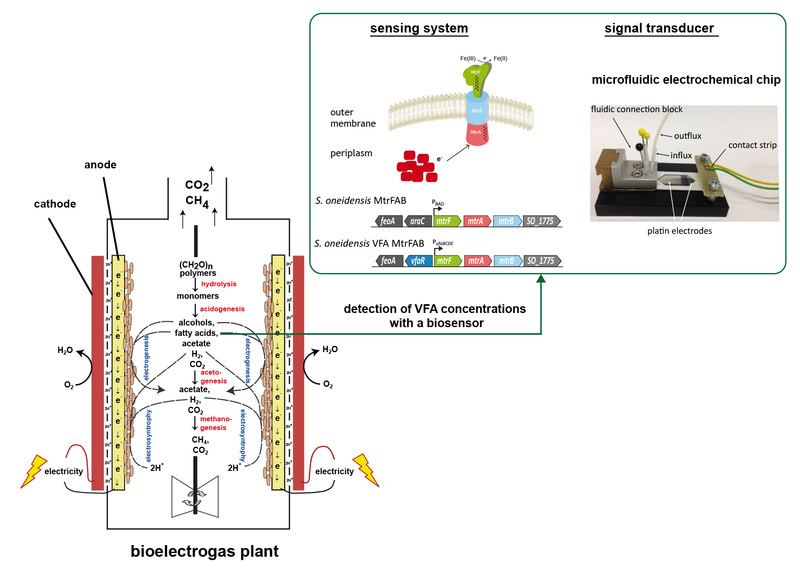 VFA concentrations are monitored with a biosensor, consisting of an engineered strain of Shewanella oneidensis MtrFAB and a microfluidic bioelectrochemical chip setup (collaboration with the group of Dr. Henkel at IPHT Jena; www.ipht-jenda.de). The biosensor responds with an electrical signal, that is proportional to the analyte concentration in the reactor. In this project, we aim to use a combination of traditional techniques with bioelectrochemical systems (4. Step) and genetically engineered strains (5. Step) for the conversion of mixed biomass waste streams (1. Step) to valuable compounds. The aim of this project is to efficiently convert a variety of sustainable substrates into platform chemicals. Both of our production organisms, S. oneidensis and E. coli, are therefore supplied with a genetically modified carbon metabolism to reduce side products to the platform chemicals. The resulting surplus of electrons is transferred to a non-depletable electron acceptor, an anode. From a biotechnological perspective, this promising new approach comprises several advantages, like anoxic processes and the generation of electrical current. A c-type cytochrome-based periplasmic electron transfer network enables S. oneidensis MR-1 to simoultaneously use interconnected anaerobic respiratory chains. 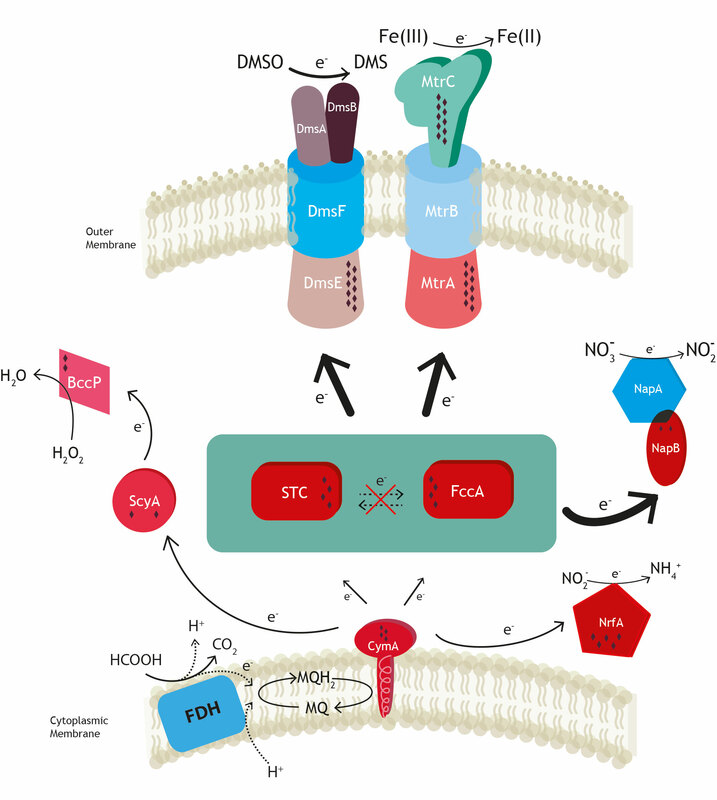 STC and FccA function as an electron transfer hub. Results were obtained verifying the necessity of either STC or FccA for at least three targets of anaerobic respiration: Fe(III), DMSO and NO3-. Currently we dissect the electron transfer pathways within the network to understand the selective advantage of interconnectivity for physiological success. The increasing use of fertilizers led to an enhanced nitrogen entrance into the environment, which results in the pollution of sensitive oligotrophic ecosystems, especially ground and surface waters in close proximity to agricultural environments. A consequence of ground water pollution has occurred in Germany, where the threshold value (50 mg/L) for nitrates in drinking water was not met in half of the measuring points. As a result the EU-committee wants to bring Germany to court because of the lack of action regarding the protection of groundwater from nitrate pollution. Field denitrification beds that contain polymeric plant material represent an easy solution for this problem and are increasingly used to eliminate nitrate from agricultural drainage waters. 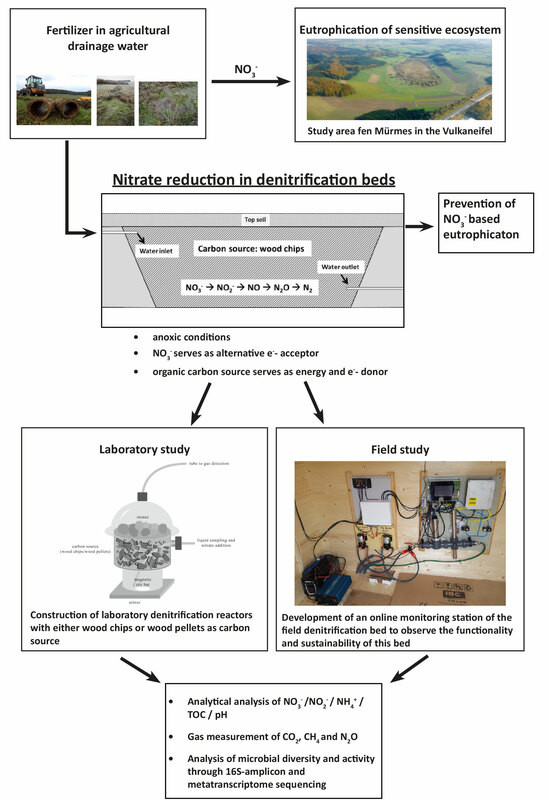 Denitrifying organisms that accumulate in these beds reduce under anoxic conditions nitrate to N2, but occasionally the end-product could be also N2O, which is a 300 times more potent greenhouse gas than CO2. 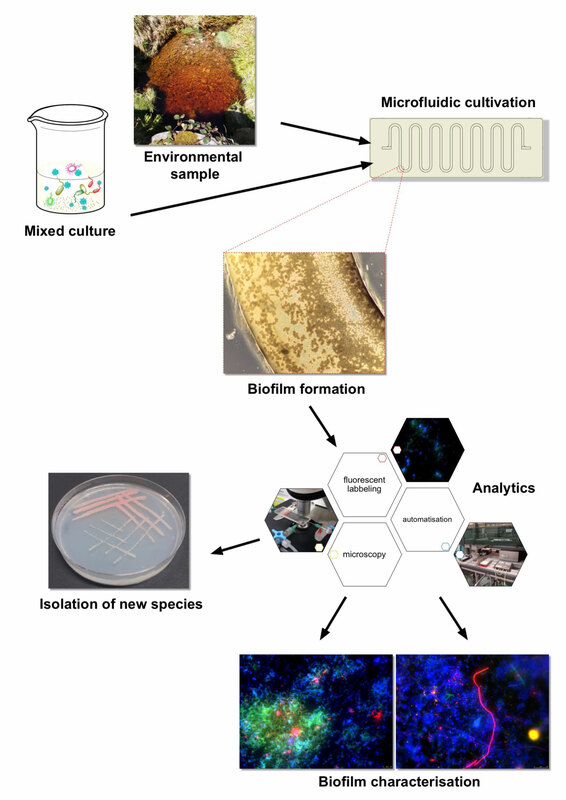 The objective of this study is to gain a deeper knowledge regarding the microbial composition and carbon degradation processes in these systems. Moreover the comparison of the laboratory and field analysis regarding the functionality of these systems should show the scalability of the process. Microbial cultivation via microfluidics has a great potential to form biofilms on an easy to handle laboratory scale. The microfluidic system we developed in collaboration with the group of Prof. Niemeyer is a chip-like chemostat bioreactor which enables different microscopic analysis using FISH or CARD-FISH. The major advantage of this new chip system is the capability as screening- or enrichment-platform mainly for the cultivation of so far uncultivable microorganisms. This project aims to combine the production of valuable chemicals with waste water treatment. 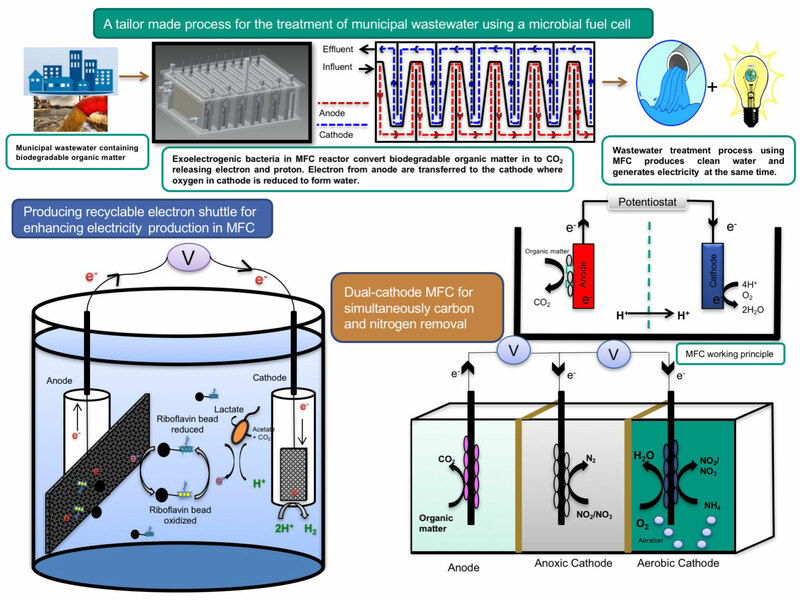 Organic carbon is eliminated from waste water using a microbial electrolysis cell. The produced hydrogen is the energy and electron source for microorganisms that produce valuable compounds from carbon dioxide. 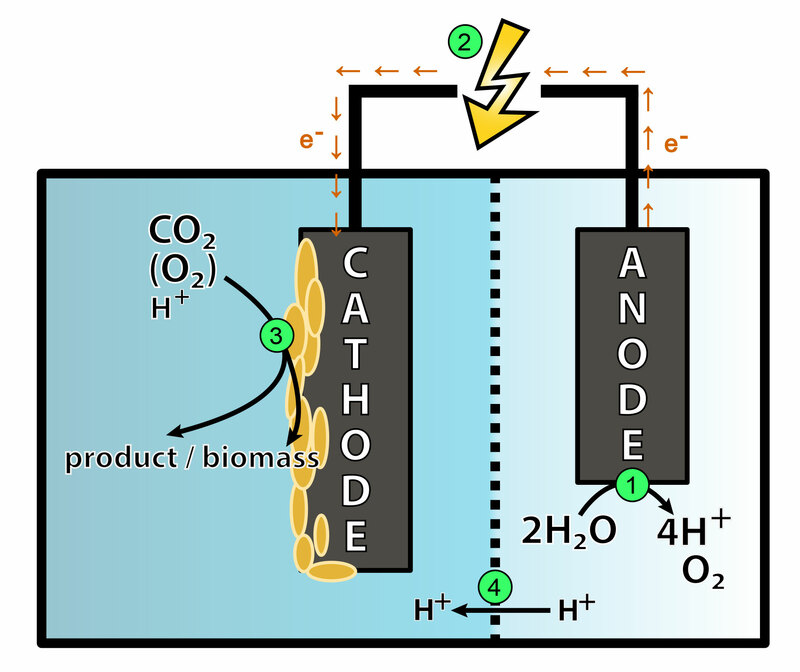 Exoelectrogenic bacteria oxidize organic carbon in waste water to carbon dioxide and transfer the respiratory electrons to an anode surface. Hydrogen is produced at the cathode using a small additional voltage. Hydrogen oxidizing bacteria (Knallgasbakterien) are used for the production of fuels and chemicals to feed a green industry. 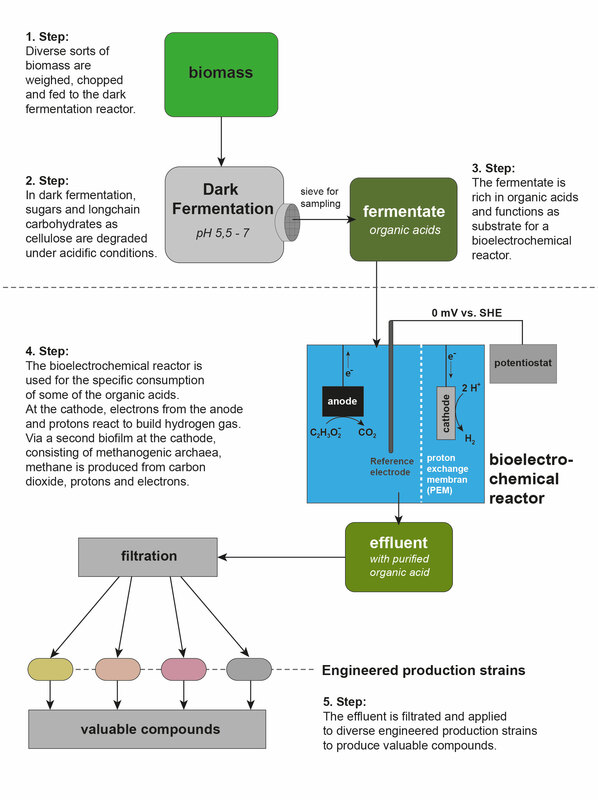 The Microbial Electrosynthesis is a bioelectrochemical technique that can be used to convert carbon dioxide and electrical energy into valuable organic compounds. At the anode (1), water is split into oxygen and protons. The released electrons flow via a power source (2) to the cathode. A cathodic biofilm uses the delivered low potential electrons as the sole energy and electron source for autotrophic growth. (3) Hence, the electroautotrophic biofilm reduces CO2 into biomass and reduced organic compounds such as acetate or methane. The use of an externally added electron acceptor (for example oxygen) allows the production of more energy consuming products like PHB. A proton permeable membrane (4) is used to close the electrochemical circuit between the two compartments. 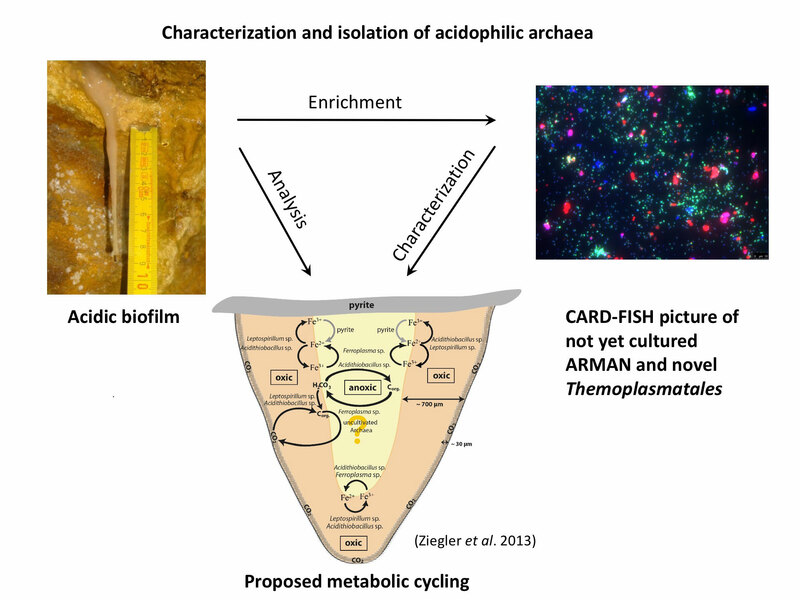 In our group, we focus on the isolation of new electroautotrophs and the understanding of the molecular processes behind the extracellular electron transfer from the cathode into the microbial metabolism. With partners from industry (EnBW, B.R.A.I.N. 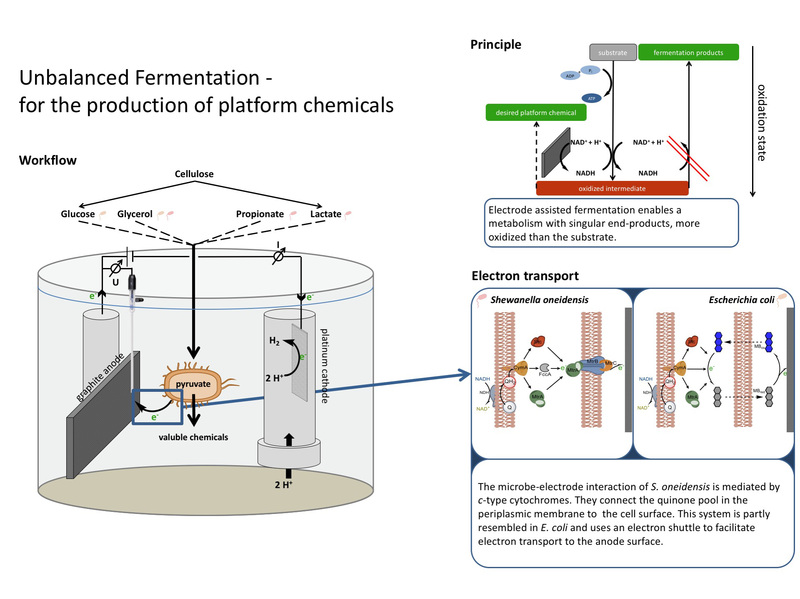 AG, Südzucker) and academia (Prof. Horn, Dr. Kerzenmacher, Dr. Dötsch) we focus on establishing bioelectrosynthesis systems for the production of platform chemicals. The aim of this project is the improvement of anodic consortia for wastewater treatment in a microbial fuel cell (MFC). 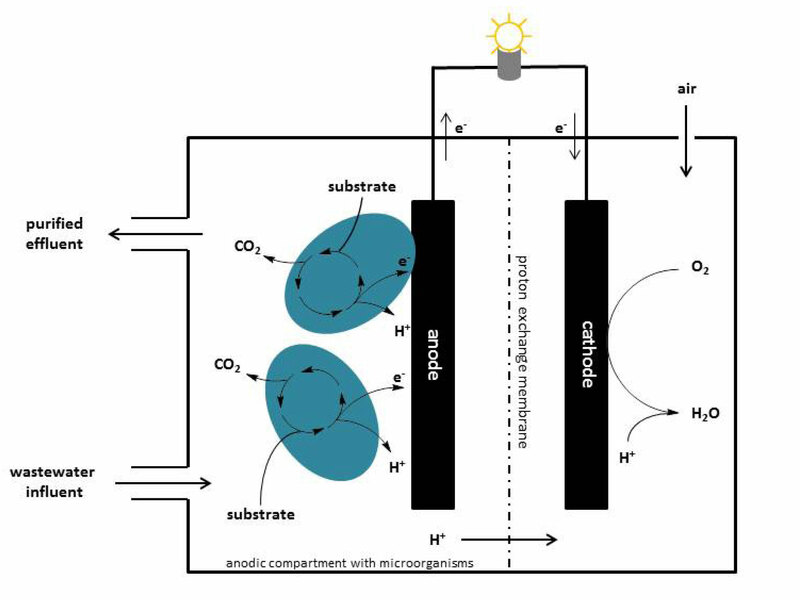 In microbial fuels cells an anode is been used by specialized microorganisms as terminal electron acceptor of their respiratory chain. Hence, the elimination of organic carbon to carbon dioxide in waste water is coupled to the production of an electric current. This work is part of the BMBF founded project Biomethanol (https://www.biomethanol.uni-freiburg.de).